Today when the word “golem” is mentioned, many people think of the character Gollum in the Hobbit movies or the Pokemon Golem. The golem of folklore, however, always had one major characteristic—it was a creature that was created by man. In today’s popular culture, the android Data in Star Trek comes much closer to the traditional golem. The major difference here being that the human created Data has super-humans qualities, while the human created golems, although very strong in body, never reach full human standards. With the exception of some stories where the golem gets out of control, the traditional golem always followed the orders given to it. It is no co-incidence that Karel Capek, the first to use the word “robot” in a 1920 play was a Czech writer from Bohemia who was without doubt familiar with the golem story. Although the Golem of Prague is the most famous of the original golem stories, the concept originated much earlier. A word related to “golem” was first used thousands of years ago in Psalm 139:16, “Your eyes have seen my unformed limbs [embryo, golmi). In the Talmud the word “golem” means “unfinished creation.” Later it was used to indicate of simpleton or uncultivated person. Because the Talmud was considered to be authoritative, during the Middle Ages this phrase was analyzed and commented upon by kabbalists (Jewish mystics) and rabbis. Rashi, the famous 11th Century Biblical commenter, thought that a being could be created by mystical combinations of God’s name. Since that time, the golem has been part of Jewish legend with various people throughout history claiming to have created golems by magical means. The legends saying the golem was a creation of the respected Rabbi Loew ben Bezalel, called the Maharal, are the most famous. Rabbi Loew died in Prague in 1609. His tomb can be viewed today in the cemetery in the Old Jewish Quarter of Prague. The souvenir shop of the Jewish museum in Prague even sells small clay models of the golem. The legends all have the Rabbi making the golem out of the clay of the Vltava (Moldau) River which runs through Prague. They say the golem’s final resting place was in the attic of the Old-New Synagogue where Rabbi Loew officiated. Actually none of the Rabbi’s writings ever mentioned anything about creating a golem. The City of Prague seems to have a legend about everything. It is not too surprising that legends were created about the golem. One such legend says that the golem was used by the Rabbi as a servant on weekdays. Just before the start of the Shabbat on Friday afternoon, the Rabbi would removed the mystical Shem (standing for the name of God) from the golem’s month. One time he forgot to remove the Shem, and since he was fearful that the golem would desecrate the Sabbath, he cornered the golem and quickly took the Shem from his month. This made to golem fall apart. In other legends from both Poland and Prague, the golem was brought to life by placing the word “emet”, meaning “truth” on the golem’s forehead. He was deactivated by removal of the first letter of “emet”, which is the Hebrew letter Aleph, signifying “Elohim” or God. This changes “emet” to “met,” meaning “death.” The name of God is necessary in all the golem stories to create its life. During the mid and late1800’s several stories were written about the Golem of Prague. 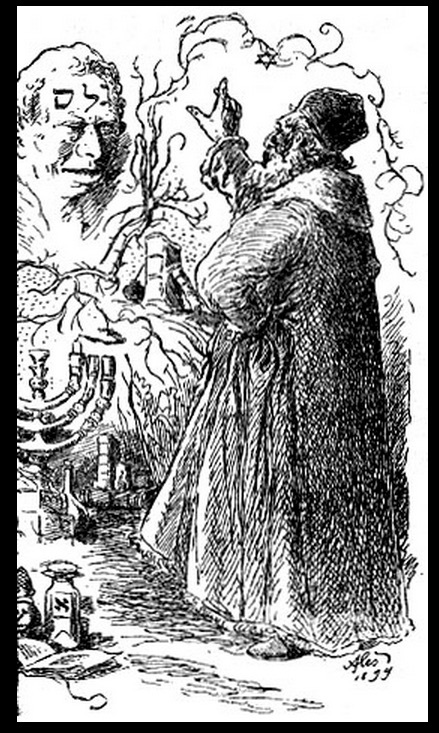 In 1909 Polish Rabbi Yudel Rosenberg published a story called “The Golem and the Wondrous Deeds of the Maharah of Prague.” According Professor Curt Leviant, who translated Rosenberg’s book, the stories “changed the direction of the legend for the rest of the 20th century.” The previous stories all had the golem doing domestic chores. The major theme of the Rosenberg story was that the golem was created to refute the false accusation of ritual murder by Jews who it was believed needed the blood of a Christian child to bake matzah for Passover. At the time of Rabbi Loew there was no evidence that this was a problem in Prague. Rosenberg claimed to have based the story upon a manuscript he found, but it appears that this was nothing but a literary hoax. Professor Leviant says that, “By adding the theme of the golem as rescuer, Rosenberg fused the anti-Semitism that pervaded Europe during his own time with that of the Golem.” The 22 stories in the book Rosenberg wrote make his golem more human than previous golems. He is given the name of Yosef, and called Yossele. Just like a human, he needs to recover after being injured. He can’t talk, but he is able to read and write. Yossele, the golem, is finally put to rest in the synagogue attic, not because he starts getting out of control as in some previous stories, but rather because it is determined that the blood libel charge is no longer a problem in Prague. Since the early 20th Century golem themes have flourished. In 1914 Gustav Meyrink published Der Golem. Isaac Bashevis Singer wrote a version of the story and even Elie Wiesel wrote a children’s book. Novels, operas, plays, and movies have been written. We can probably credit the golem stories for inspiration for the characters of Frankenstein, Superman, and many others. This entry was posted in Elves, Leprechauns,Golems.